A minimum of four-year, 120-credit Baccalaureate degree in agriculture or environmental science or an equivalent degree that includes: A minimum of a diploma, applied degree or degree from a post-secondary institution recognized by the council with credit in all of the courses related to the practice of agrology required by the council. Of Alberta Institute of Agrologist (AIA) members who received their education in Alberta, 55% took their education at the University of Alberta. 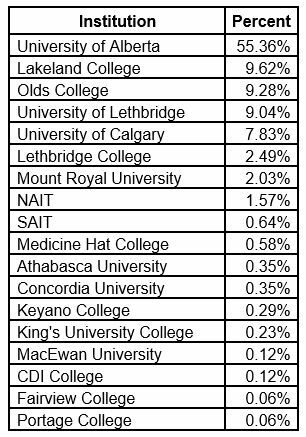 Members who were educated in Alberta received their education at 18 different institutions (see table below). The full report on the educational profile of AIA members is here .